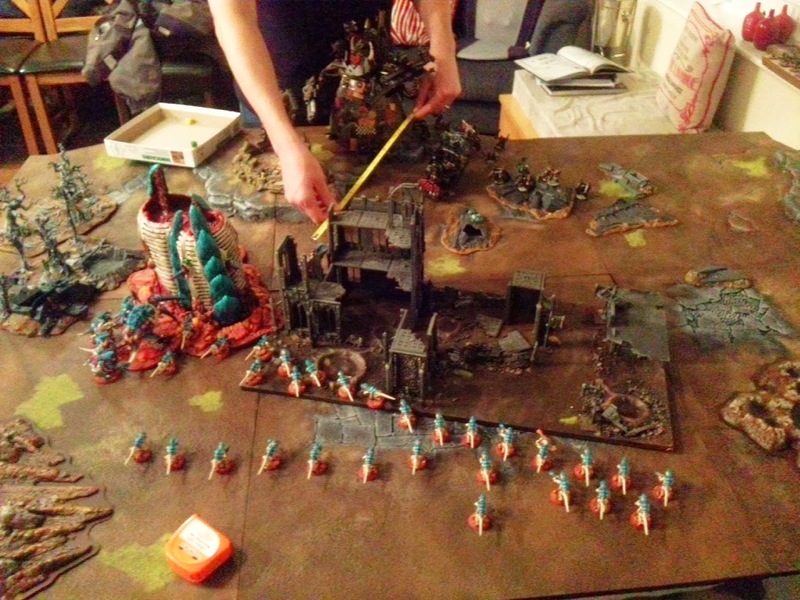 Confessions of a 40k addict: 1500pt battle report - nids vs Orks - Escalation! 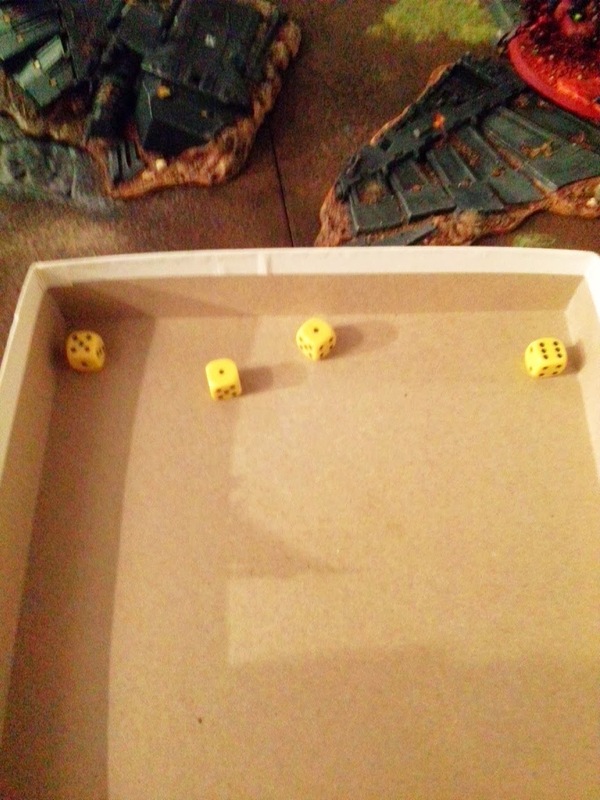 Bother, I went and lost my sheet with my Psychic Powers on, so much for a fully featured Battle Report. Still, I'll try and make do. I think it was Kill Points with Vanguard Strike as the setup. 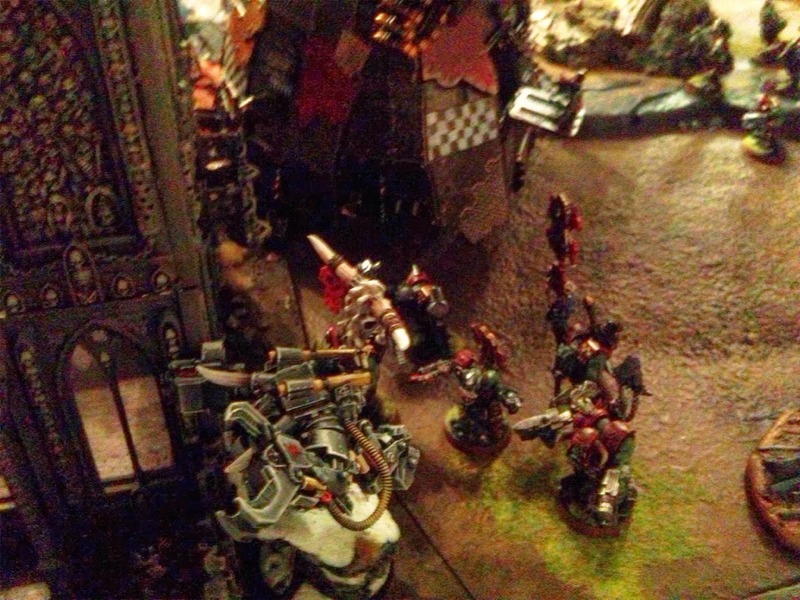 I got and Escalation Warlord Trait to Deep Strike on target within 6" of the Stompa. 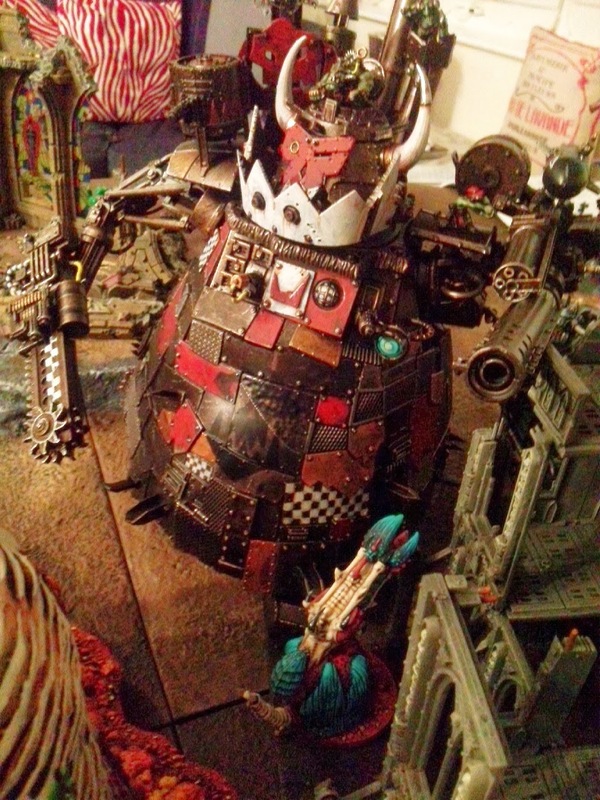 Ben had a Stompa [and I had nothing to harm it! 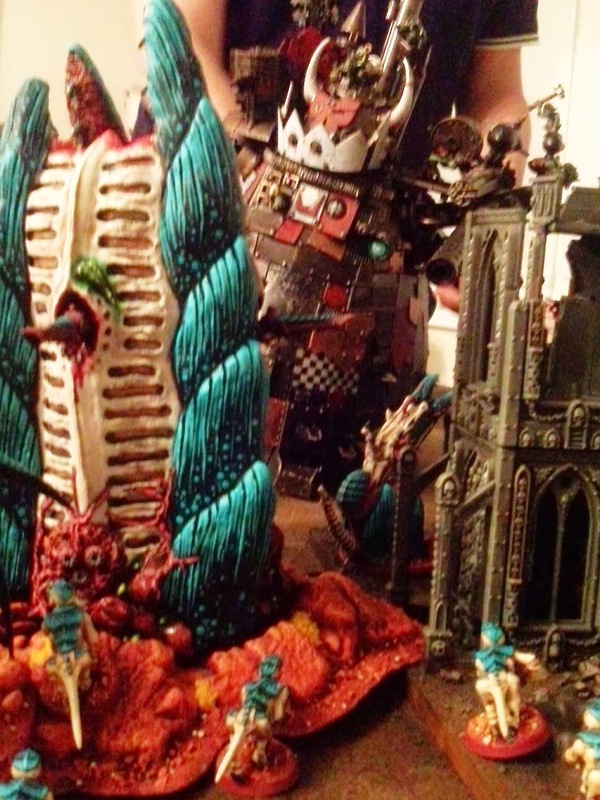 ;) ] and Ghazkull in a trukk with a bunch of Nobz. OK, what?! That Stompa can move 12"! Good lord, it's like Usain Bolt! Thankfully I've got my Bastion between it and my frail little gribblies. 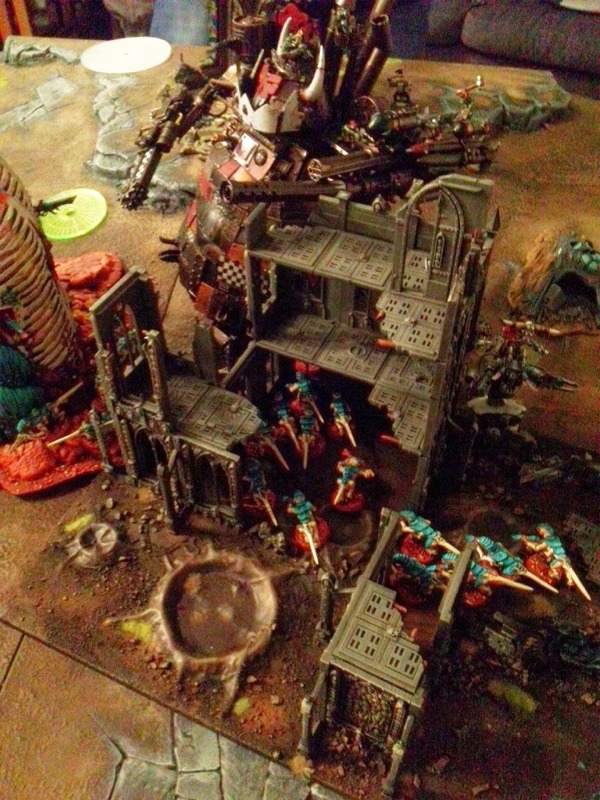 Well, except my Quad Gun, which was out in the open where it would have decent field of fire when I got to it. And thuse was pretty much the only thing that could be shot, so it was, and it was destroyed. 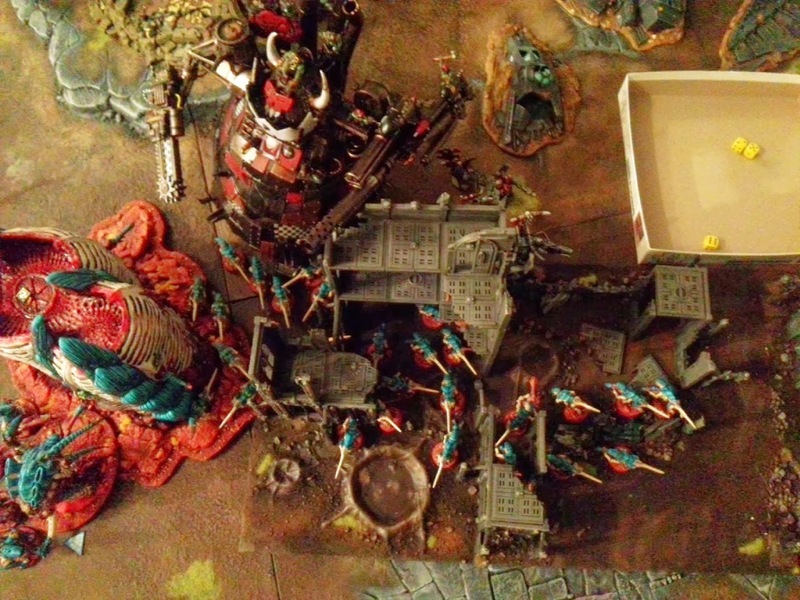 A couple of other gaunts were targeted, with blast weapons, that conveniently deviated, clipping the bastion and I think removed 2 Armour Points and destroyed the right Heavy Bolter. 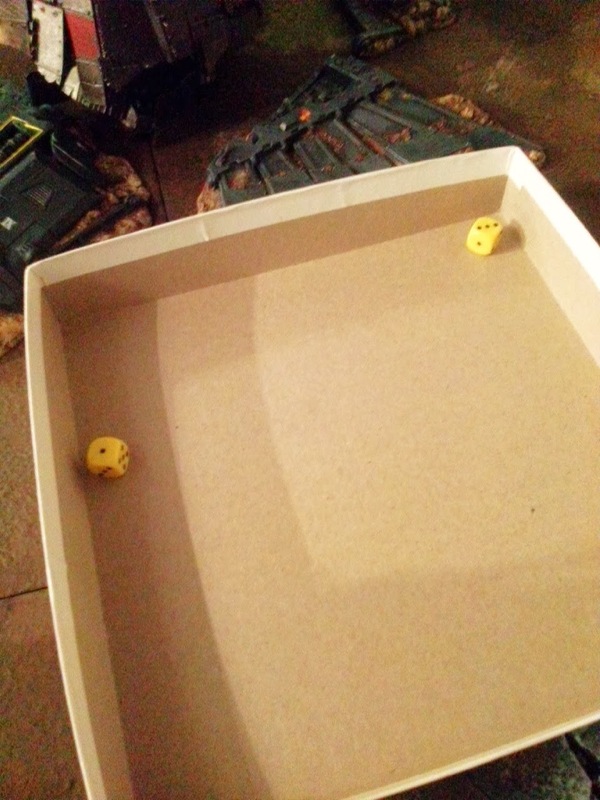 The Tervigon that was also clipped saved thanks to the 3+ cover save from the Fortification. 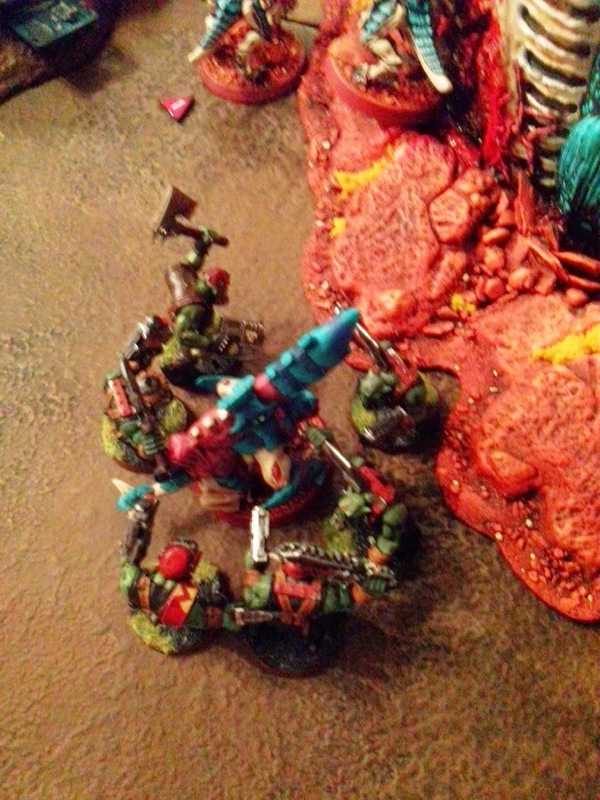 In retaliation I took down the Trukk, taking a couple of Nobz with it. 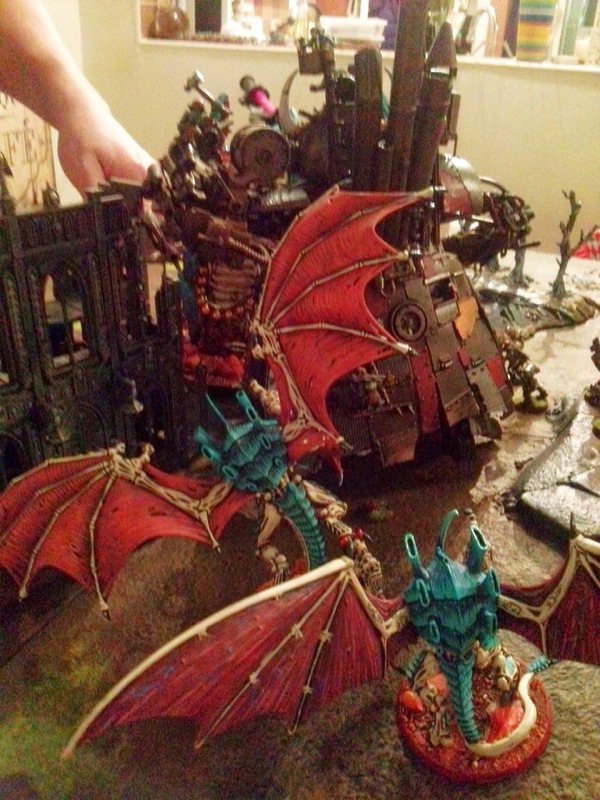 Ghazkull just jumped out of the wreckage eager for a scrap. 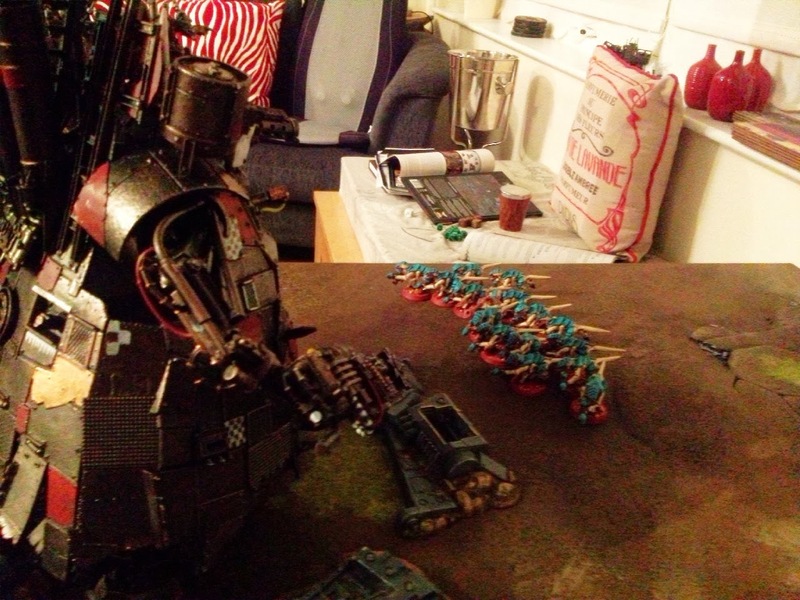 Ha, ha, David's and Goliath! S, that didn't go down to well, 6 or 7 dead. 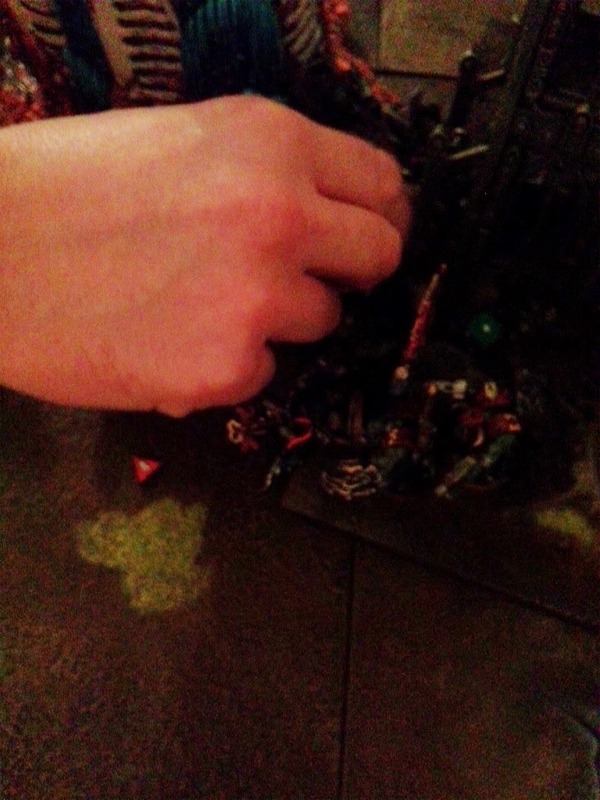 And then the Nobz come in and chop them to pieces. 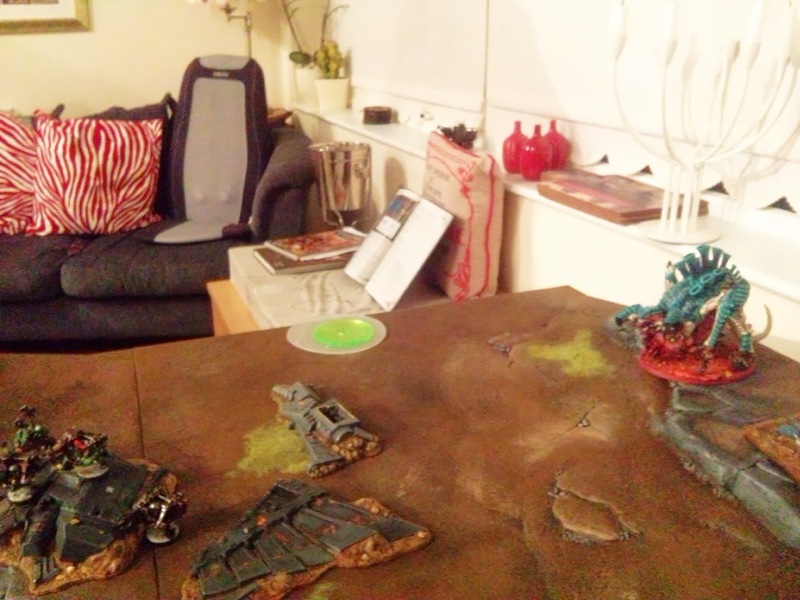 The only thing saving me now is that Bastion, stopping the Stompa from getting to my Tervigon, Hive Guard and Biovores. Luckily he can't attack it because it's unoccupied [although the Ben was particularly pleased to discover that Stronghold does in fact now allow non-occupied buildings to be targeted, since as you purchase it it is considered 'claimed' and all 'claimed' buildings can be shot or assaulted. Of course, Aegis Defence Lines and Skyshield Landing Pads do not have Armour Values so can't be targeted, it's a full on weapons race this!]. So we're reduced to skulking and hope the Flyrants can break the deadlock. 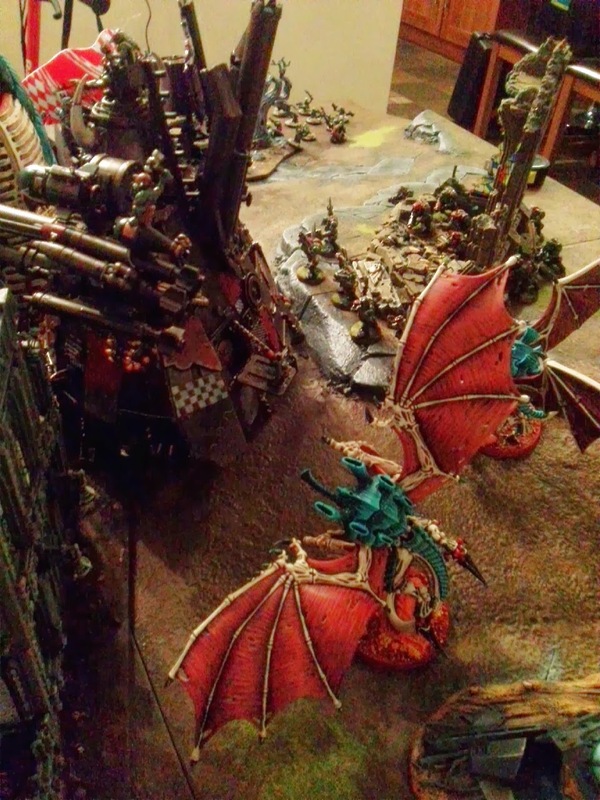 The Tervigon arrives, on the wrong flank! Warlord comes in on target, thanks to Warlord Trait, second Tyrant also arrives. Spore Mines also arrived and I think I totally misinterpreted the rules and thought they could blow up on arrival, but I don't think the four mines even glanced the back of the Stompa but did kill an Ork or two. 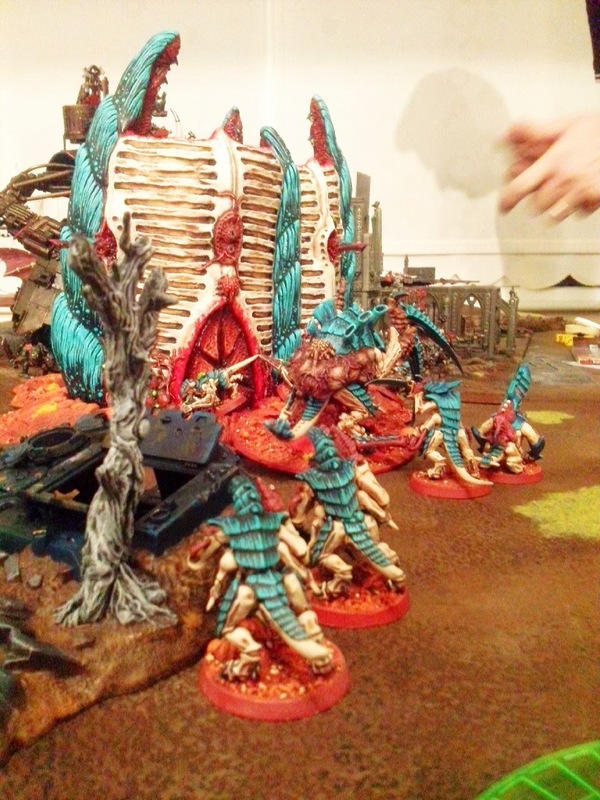 Tervigon spawned, not sure how many, looks about 8 and I think the Biovores may have got lucky against the Big Shootas in the wrecked Aquila Lander. 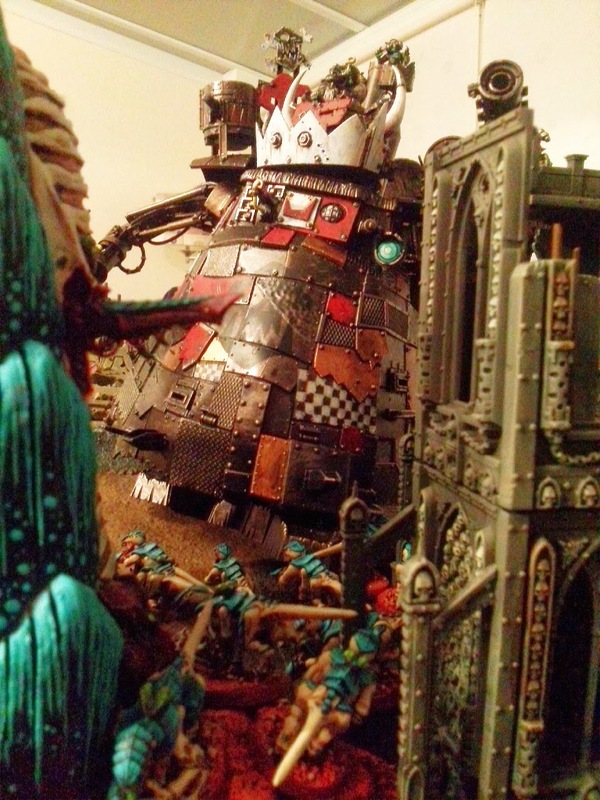 Whereas the Flyrants were appalling against the Stompa, I think only managing one glance on it's rear armour with around 20 hits [ I think one of the Tyrants managed 11 of his 12 shots!]. 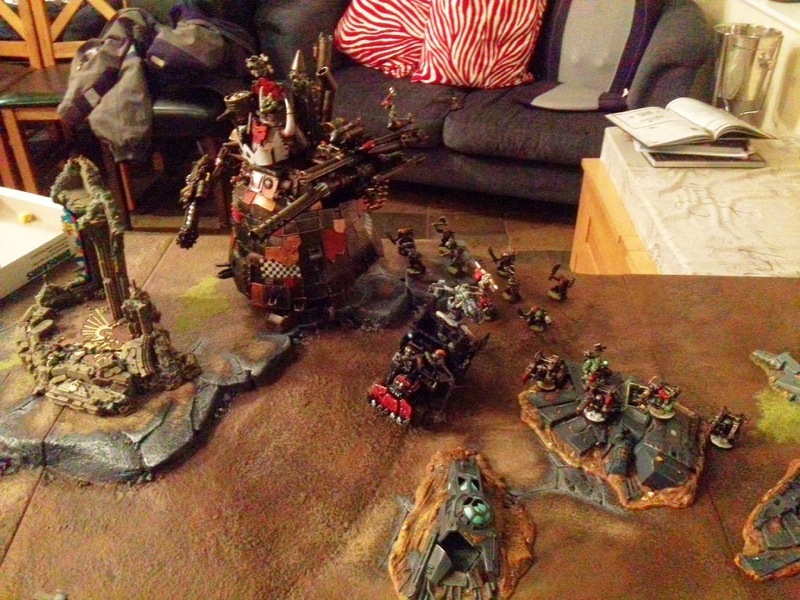 And the Grots turned up! 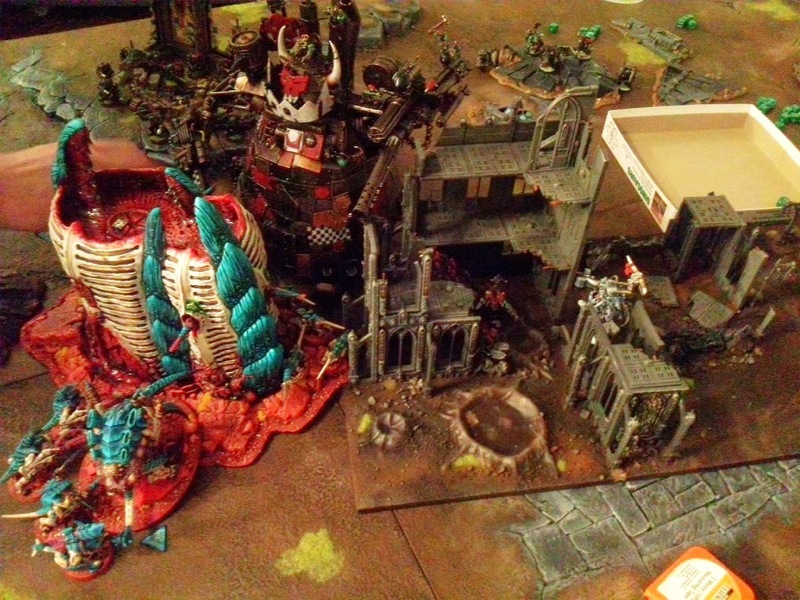 I repositioned my back field, managed to get some Biovore shots on the Grots but they stubbornly stayed on the board. Both Flyrants were shot out of the sky and just riddled with bullets, killing one. 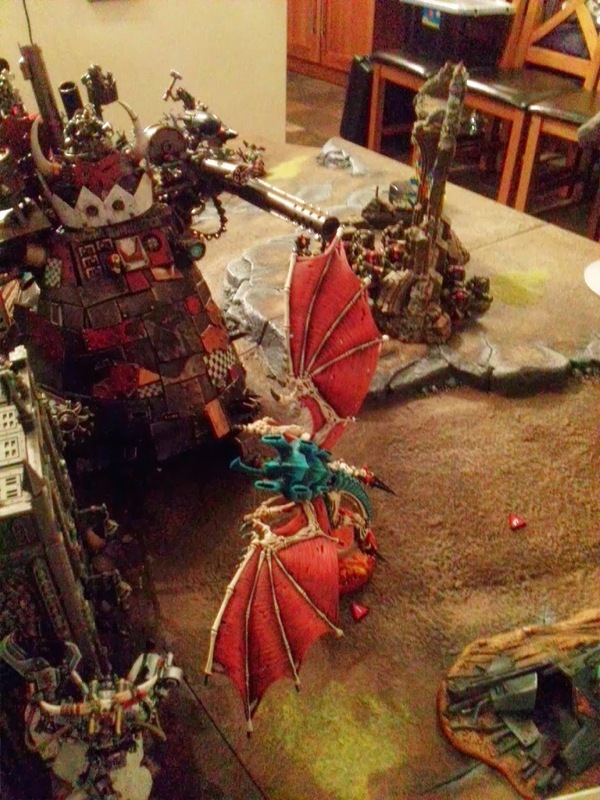 The Tervigon was wounded and it's spawn reduced to two. I think this was a saving throw, I think those two ones are probably not good for me! And that's what I get for going toe-to-toe with a 'Lord of War'. 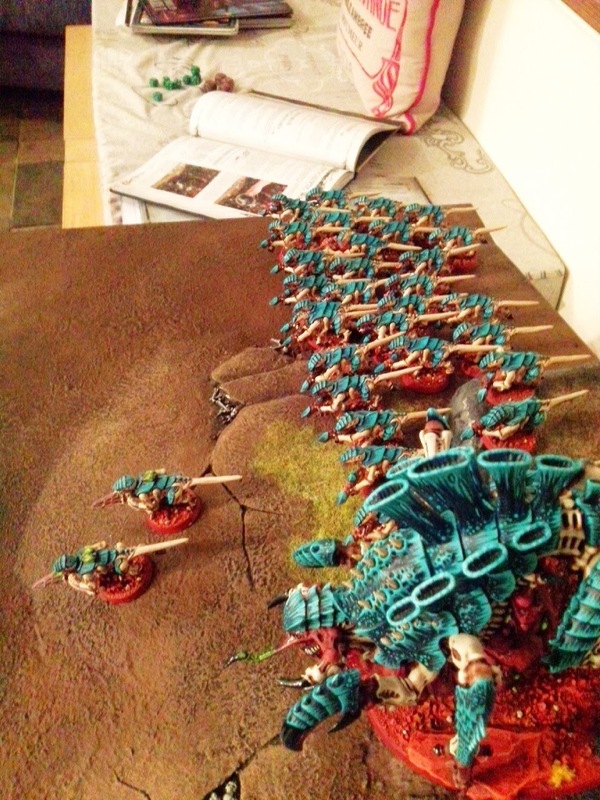 looks like my Termagants were thinned out a bit too. That looks like another poor save. 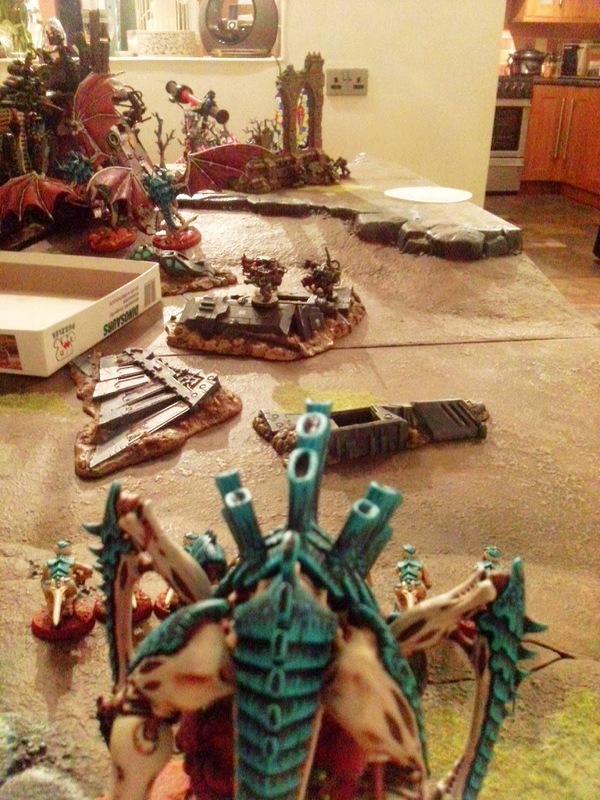 And the Biovore's fate looks sealed too. I was roundly slaughtered. Apologies, for some of the vagaries, I really should have written this up sooner and having the army list with the result on would have helped. I'm pretty sure I was able to put 3-4 glances on the Stompa gaining me a VP. I'm not sure if I was on 3 or 5 by the end, but Ben was on a stupid amount. 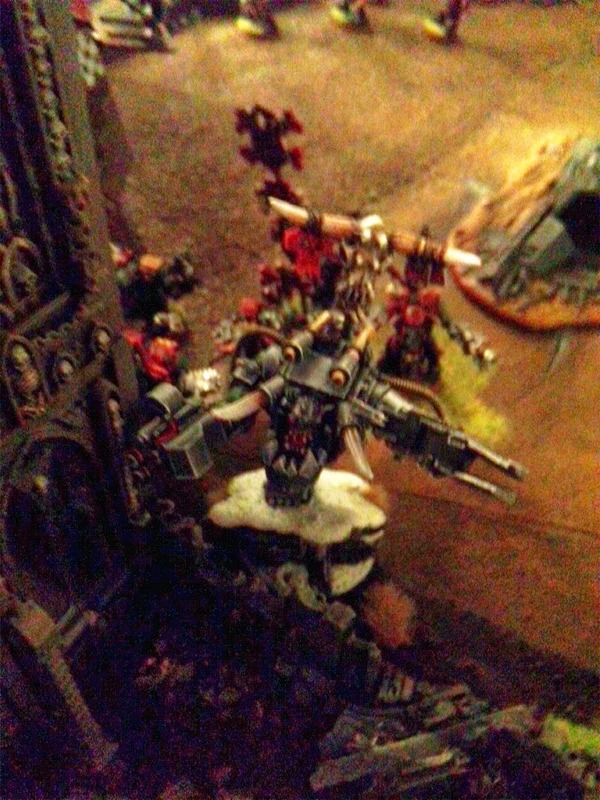 With hindsight I should have just ignored the Stompa but when it comes lumbering towards you and you've got four S8 Impaler Cannon shots you feel obliged to have a go given they're pretty much the only thing I have that can damage it. I'd have been better off taking the Boyz down. Once again I can't categorically state that the new Codex was the reason for my loss, I think the Stompa pretty much took care of that. 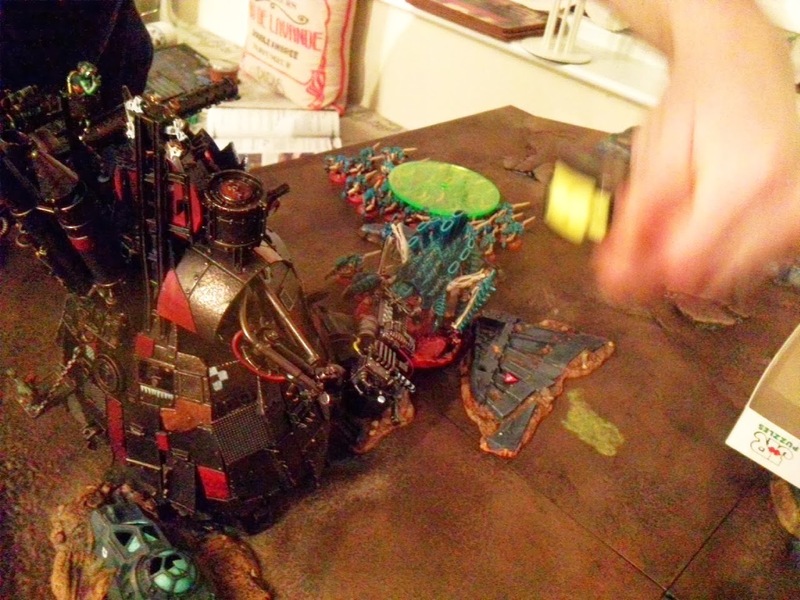 Ben didn't struggle too much against my 'horde' though but I certainly found the most annoying thing was my Bastion - a massive obstacle to steam rolling my back field. 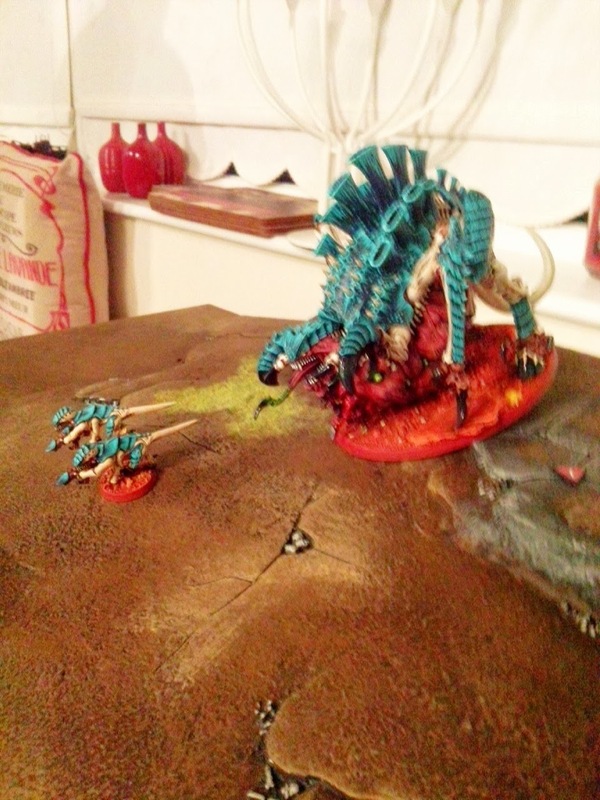 I'm sure his intense scrutiny of the Stronghold Assault rules and discovery he'll be able to target it in the future is evidence of why it was my MVP, practically the only thing that kept my nids alive. Another learning experience though, we'll add it all to the Hive Mind. 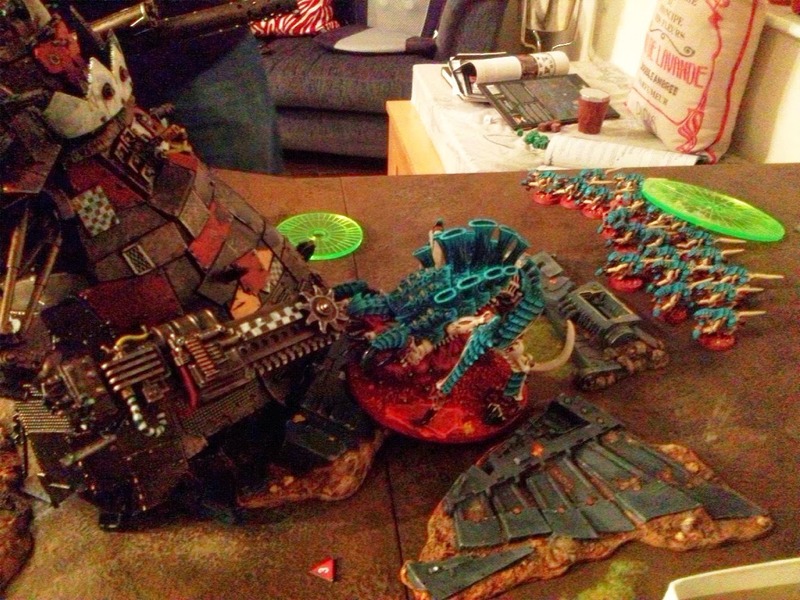 Incidentally Otty played him the next day, a couple of Tyrranofex taking the Stompa down with some lucky penetration rolls that did multiple Hull Point damage. So Ben is still going to give the Stompa a new lick of paint but if it continues to be a liability he may well drop it, especially as he's just picked up a KillBlasta tank off ebay for around half price! 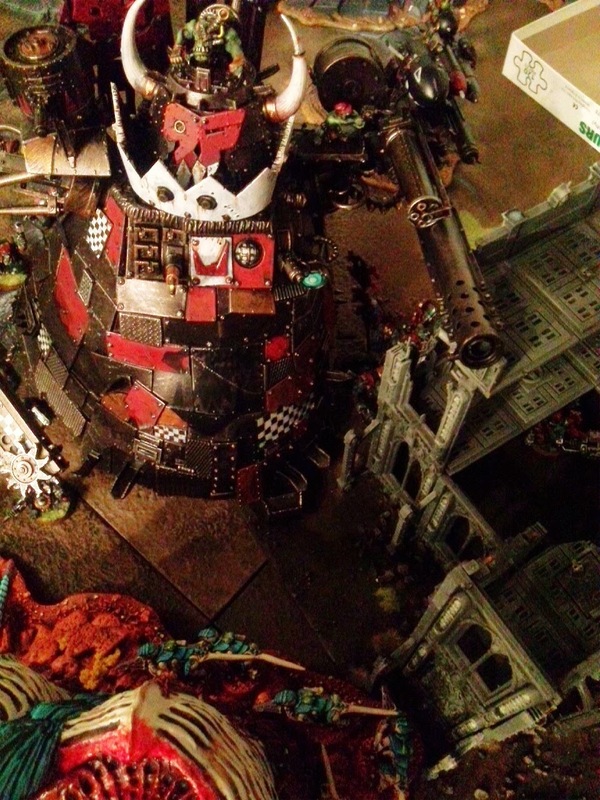 Thanks, we do ensure we play with as much painted models and scenery as possible. Nice report Dave, but tell me have you tried any dakafexs yet ? I run two broods ot 2 in the couple of games I've had & found them very good. 24 twin-linked s6 per brood is a hell of an amount of fire & it might even have made the stompa worried. Not yet, I've just got one off ebay. 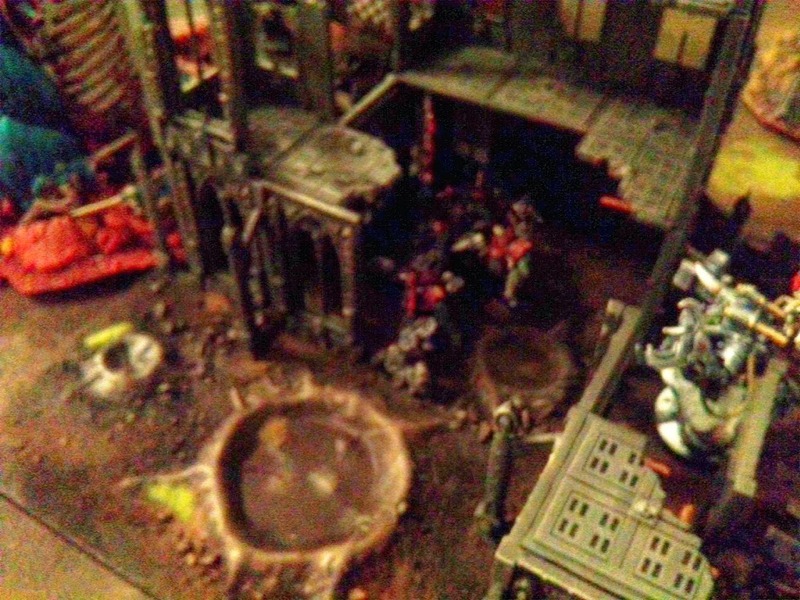 However, given the Devourers can only glance the rear of the Stompa and the 24 shots from the Flyrants was unsuccessful and they managed to get those rear shots I have my doubts over the potential of the Dakkafexs given they don't have the mobility of the Flyrants. Cheaper though and stronger in combat but again I saw what happens when you engage with Lord of Wars in combat with the Tervigon! I think I need to adopt the old Flyer practice - ignore it! But don't forget a fex is s9 basic so if you charged the stompa with a couple of these guys with rerolling armour pen you should do some damage, btw I had tought they where av12 all round guest that not the case lol. Front and Side are 13 and as it's a walker that's what you have to penetrate :( The s9 carnifex are great, but I'd got crushing claws on the Tervigon, which with Armour Bane was 2D6 + 5 for penetration so it's a similar average. Although Carnifex do get the D3 Hammer of Wrath attacks, which at that S9 might tip the balance in their favour. 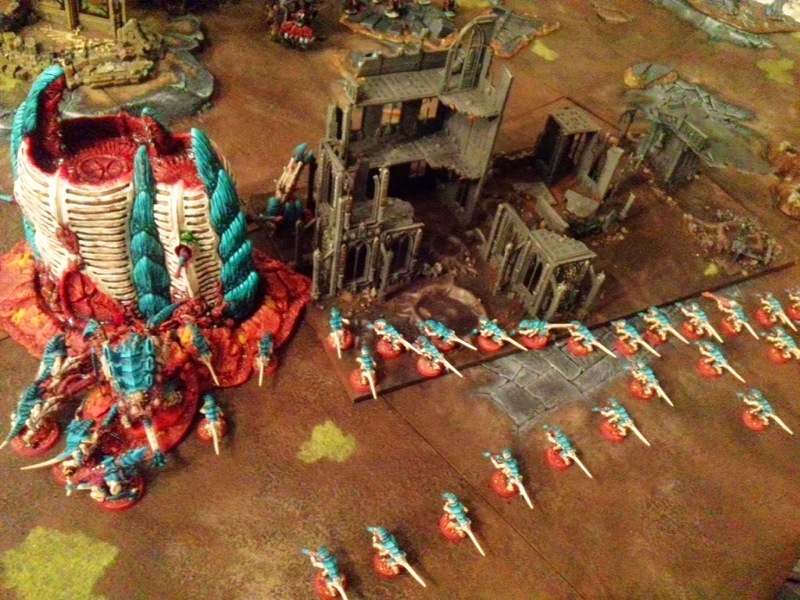 I think if you're going to assault any Lord of War that has an assault D-weapon it better be down to it's last or perhaps second to last wound/HP and you better be able to hit first and multiple times. 'Cos if you miss, you're dead! 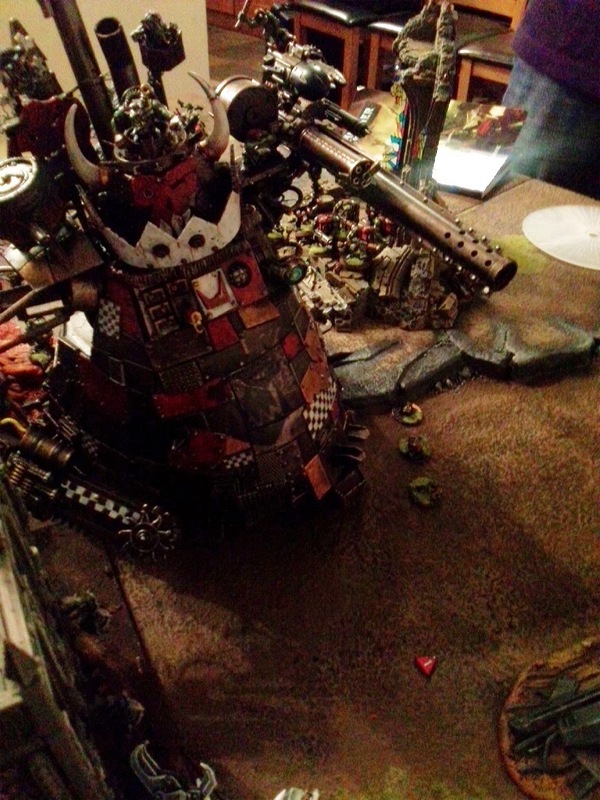 hi dave great report I agree that your bastion was your MVP it got in the way and prevented my stompa from getting to grips with your terevigon and hive guard :). 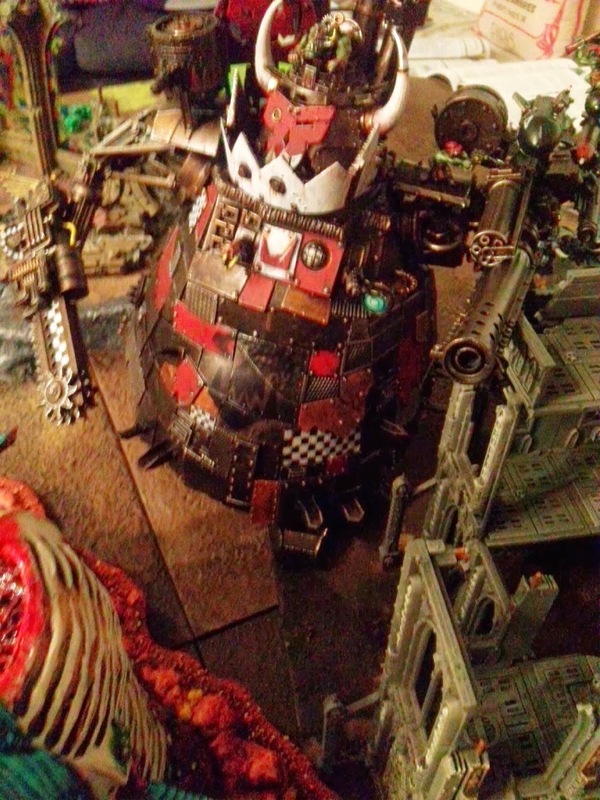 Just for the record my scrutinizing of the stronghold assault rules was because I have built a void shield generator for my Orks to help my stompa survive against shooty armies, i thought that if I didnt put a unit in the building then it wouldnt be able to be targeted so increasing its survivability. 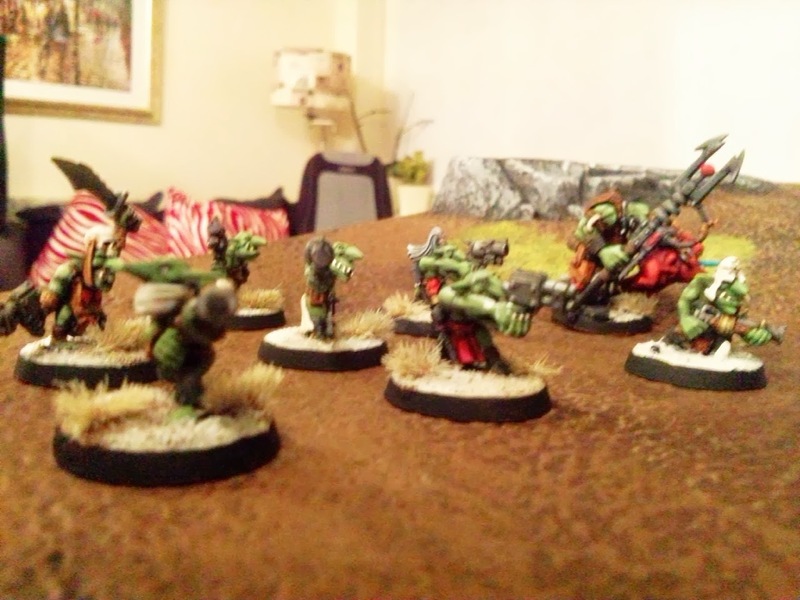 Unfortunatley i found that in the stronhold assault rules that like you said its owned by the player who bought it and is counted exactly like any other unit in your army so can be assaulted and shot at, I was slightly disapointed to be honest. Thanks for another great game Dave. Otty has beaten me twice now with a nid army but he has a more shooty army than you have and he also attacks the stompa with multiple monsterous creatures which seems to do the trick :) i have found that Im not to sure what to do for the best with the stompa as its not bad at shooting and is really good at closecombat, consequently its hard to use.